Your day-by-day itinerary now includes Tour Old San Juan, Rumba, Fortaleza Street, and other attractions you added. Kick off your visit on the 1st (Fri): contemplate the long history of San Juan National Historic Site, take in the local highlights with Tour Old San Juan, appreciate the extensive heritage of Old San Juan, then take an in-depth tour of Cathedral of San Juan Bautista, then stop by El Galpon, and finally don't miss a visit to Fortaleza Street. To see traveler tips, reviews, maps, and more tourist information, go to the San Juan sightseeing planner . Fort Lauderdale, USA to San Juan is an approximately 6-hour flight. You can also do a combination of bus and flight; or do a combination of flight and car. The time zone changes from Eastern Standard Time to Atlantic Standard Time, which is usually a 1 hour difference. Plan for somewhat warmer nights when traveling from Fort Lauderdale in March since evenings lows in San Juan dip to 73°F. Finish your sightseeing early on the 2nd (Sat) to allow enough time to drive to Arecibo. Arecibo is a municipality on the northern coast of Puerto Rico (U.S.), on the shores of the Atlantic Ocean, located north of Utuado and Ciales; east of Hatillo; and west of Barceloneta and Florida. Kick off your visit on the 2nd (Sat): explore the fascinating underground world of Parque Nacional de las Cavernas del Rio Camuy, explore the fascinating underground world of Aventura Cueva Ventana, then explore the fascinating underground world of La Cueva del Indio, and finally get the adrenaline pumping with Toro Verde. 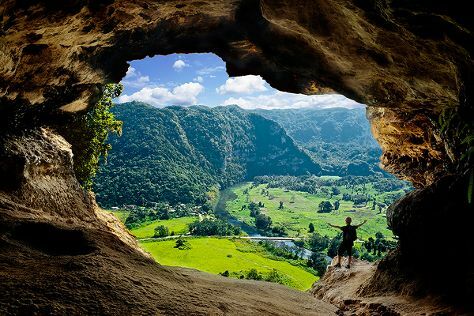 To see traveler tips, photos, ratings, and more tourist information, you can read our Arecibo day trip planning website . Traveling by car from San Juan to Arecibo takes an hour. In March, daily temperatures in Arecibo can reach 82°F, while at night they dip to 70°F. Finish your sightseeing early on the 3rd (Sun) to allow enough time to drive to Fajardo. On the 3rd (Sun), delve into the lush surroundings at Pinones, take a peaceful walk through El Yunque Rain Forest, take in panoramic vistas at Yokahu Observation Tower, then examine the collection at El Portal Tropical Forest Center, and finally kick back and relax at Balneario Luquillo. For traveler tips, more things to do, ratings, and more tourist information, go to the El Yunque National Forest online trip itinerary planner . You can drive from Arecibo to El Yunque National Forest in 1.5 hours. Alternatively, you can do a combination of taxi and flight. March in El Yunque National Forest sees daily highs of 85°F and lows of 73°F at night. Wrap up your sightseeing on the 3rd (Sun) early enough to drive to Fajardo. Fajardo is a small city and municipality in Puerto Rico (U.S.) located in the east region of the island, bordering the Atlantic Ocean, north of Ceiba and east of Luquillo. You've now added Bioluminescent Bay to your itinerary. Start off your visit on the 3rd (Sun): make a trip to Bioluminescent Bay. To find traveler tips, maps, where to stay, and more tourist information, read Fajardo day trip planning website . Fajardo is very close to El Yunque National Forest. In March in Fajardo, expect temperatures between 84°F during the day and 72°F at night. You will leave for San Juan on the 4th (Mon). For maps, more things to do, and tourist information, read our San Juan vacation maker website . Traveling by car from Fajardo to San Juan takes an hour. Alternatively, you can take a shuttle. On the 4th (Mon), you'll travel back home.